FEWSION for Community Resilience (F4R™) is the process and its tools that have emerged from the first cycle of the 2018 pilot program called PLACE4FEWS. 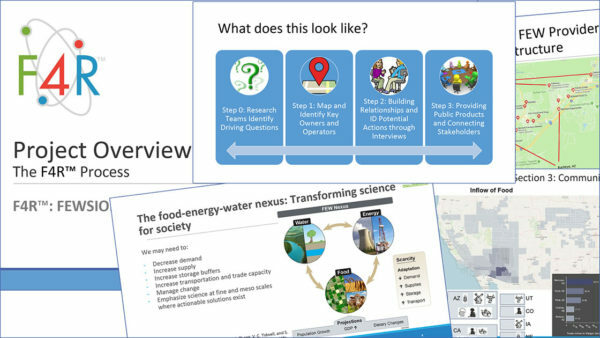 With funding from a National Science Foundation grant, we are reaching out to our community to map and to dialogue about our Energy, Food, and Water Systems (FEWS) in 2019. We all depend on these “lifeline” resources for our health and security, in our daily lives, during emergencies, and in the future development of our community. Yet most Americans do not know where these resources come from, cannot identify who provides them, and do not understand the benefits of, or threats to, these systems. What does F4R™ look like? Help us improve the resilience of Flagstaff by identifying ways to limit vulnerability and increase the sustainability of our Food, Energy, and Water supply chains. We are developing a national database, one community at a time so that we can answer these questions in our community. We are also using this data to start grassroots conversations between community members and stakeholders to create the opportunity for positive change. You are invited to participate as a volunteer, guest speaker, or contributing stakeholder! What is this project? Why should I help? PLACE4FEWS is a pilot program for a national grassroots community-based research project that engages the local community in an effort to improve their food, energy, and water systems. PLACE4FEWS is developing a database, and using this data to start grassroots conversations to create the opportunity for positive change. What kind of data is being collected? We seek to identify which companies, nonprofits, utilities, and public agencies that are providers and stakeholders in our community’s food, energy, and water systems. We are also trying to identify the major infrastructures, sources, suppliers, routes, transit modes, and distribution systems for these resources including the “last mile” where wholesale suppliers distribute resources to retail customers. This information provides opportunities for key stakeholders to be included in conversations about positive change. *While we will make a reasonable attempt to avoid collecting or disclosing sensitive data, any data you disclose to the PLACE4FEWS project becomes the property of NAU, and you grant NAU and its partners’ full rights to its use. Use the “contact” page feature, or send an email directly to fewsion@nau.edu. The PLACE4FEWS project is a Public Service of Northern Arizona University, a partnership between the Center for Science Teaching and Learning and the School of Informatics, Computing, and Cyber Systems (SICCS) as a supplement to the FEWSION project, led by SICCS professor Benjamin Ruddell. Funding is provided under National Science Foundation Grant ACI-1639529 to recruit citizen scientists to actively map and study local community food, energy, and water systems (FEWS) for the Flagstaff area (PLACE4FEWS project).